De Colores: The Raza Experience in Books for Children: Esteban de Luna, Baby Rescuer! 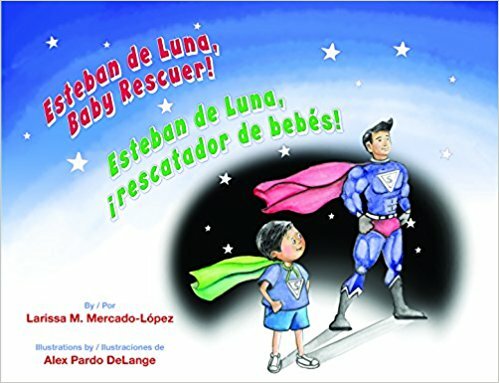 / Esteban de Luna, ¡rescatador de bebés! Esteban, an active little boy who appears to be about five, dreams about becoming a superhero. In fact, he wears his long, green cape “that ripples like a flag on windy afternoons” every day and everywhere: “He wears it to breakfast. He wears it to the park. He wears it to the doctor’s office. He even wears it to the supermarket.” Esteban’s problem, though, is that his cape is not magic and doesn’t do anything special. In fact, it doesn’t do anything at all. It’s just a cape. Well, this is not good, and youngest listeners and readers might expect that, somehow, Esteban’s cape will change in some way to infuse him with superpowers. But it doesn’t. Totally bummed out, Esteban tries to sell it, but no one wants to buy an ordinary green cape that does nothing. One day, while Esteban plays at the park with his mom and little sister Lola, he sees an abandoned baby doll, all alone on the swing. As a sudden storm causes them to run for shelter, Esteban looks back at the doll and decides he must rescue her. So he does. Tying her snugly in his cape, which now takes on an additional function, Esteban jumps puddles and walks under the bus stop shelter to keep his doll dry. “Let’s go to the park!” says their mom. —¡Vamos al parque!—dice su mamá. DeLange’s expressive digitally enhanced mixed media illustrations on paper follow the action and capture the moods of a warm, loving Latinx family. Rendered in mostly watercolors and ink on a palette featuring bright yellows, greens and blues, the art centers on young Esteban’s dilemma and its resolution, and features toddler Lola’s nonstop activity, pregnant mom’s expert balancing act, and dad’s calm sharing of a story with the children. Young readers’ eyes will also locate Esteban’s cape, Chico the puppy, and later the doll, on almost every page, and adults may notice that dad suspiciously resembles Clark Kent. Esteban makes a sign and sits in his front yard one morning. “Cape for sale!" he shouts. He sits. And sits. And sits. No luck. Una mañana, Esteban hace un letrero y se sienta en el jardín de enfrente. —¡Se vende una capa!—grita. Espera. Y espera. Y espera. Nada. The unstated message in this lovely little picture book—for the youngest hablantes as well as those who are bilingual or English-only speakers—might be that the concept of “boys will be boys” (whatever that meant, once upon a time) is finally being changed, and that kindness, caring, love and compassion are not gender-specific. Esteban de Luna, Baby Rescuer! / Esteban de Luna, ¡rescatador de bebés! is highly recommended.